I loved Valentine’s Day as a kid. The approach was great…addressing all those tiny envelopes, picking out just the right card for each kid in my class. I think the best part of the whole day, even better than opening my cards and candy from classmates, was making the special mailbox in class and then delivering all my valentines. For some reason, I always loved that part…finding everyone’s box and sneaking in a card and a treat. School always felt exciting on Valentine’s Day; special writing assignments, love related art activities, and special Valentine’s Day books. Well, I enjoyed Valentine’s Day books as a kid and I enjoy making booklists now. So…drumroll please…I now present to you my 2012 Valentine’s Day booklist. 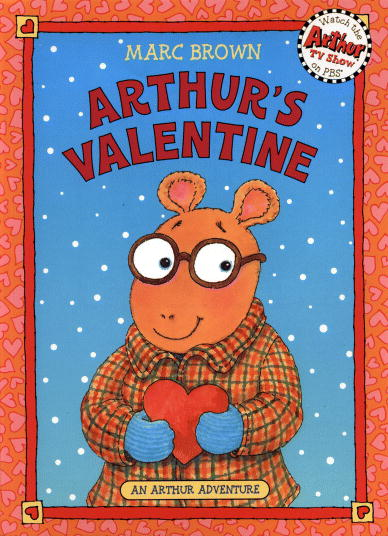 “Arthur’s Valentine” by Marc Brown – Arthur is getting notes from a secret admirer and he thinks he knows who is sending them, but is his guess right? “The Ballad of Valentine” by Alison Jackson – In a charming rhyme, a man tries to send his love in writing and deliver it all kinds of ways, but everything seems to go amiss. “Chocolatina” by Erik Kraft – Tina loves chocolate so much people call her Chocolatina. But what happens if you really are what you eat? Take this as a warning to not eat to much Valentine’s Day candy, and to stay away from hungry teachers. “Love, Splat” by Rob Scotton – It is Valentine’s Day in Splat’s class at cat school and he has a special valentine for a special kitten, but he isn’t the only one. “The Giant Hug” by Sandra Horning – Owen wants to send his Grandma a hug through the mail…not a picture, a real hug. Owen’s giant hug passes from person to person, but will everyone pass it on until it reaches Granny? “Plant a Kiss” by Amy Krouse Rosenthal – In this sweet rhyme, Little Miss plants a kiss. Something wonderful grows and she decides to share it with everyone. “Roses are Pink, Your Feet Really Stink” by Diane deGroat – Gilbert can’t think of nice things to say in two of his Valentine’s cards so he writes some nasty rhymes instead. To stay out of trouble, he signs other people’s names, but what will happen if they find out his trick? “Saint Valentine” by Robert Sabuda – This biography of Saint Valentine is illustrated with mosaic style art. A note on the text provides more historical background on the man and the holiday. 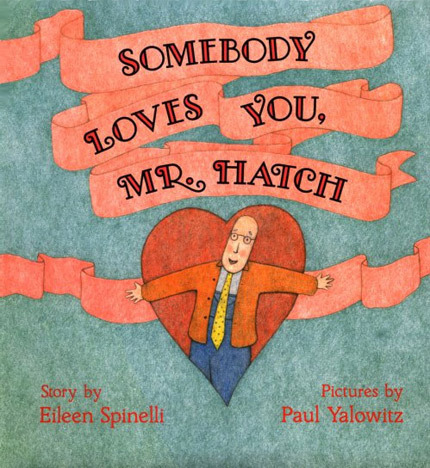 “Somebody Loves You, Mr. Hatch” by Eileen Spinelli – Mr. Hatch receives a Valentine’s package with a note that says “Somebody Loves You” and it changes the way he looks at the world around him. “The Berenstein Bears at Camp Crush” by Stan Berenstein – The cubs are looking forward to a fun summer at Camp Grizzmeyer, but the director is tyring to keep the boys and girls apart. How long can these rules last? “Junie B. Jones and the Mushy Gushy Valentine” by Barbara Park – The 14th book in the Junie B. series, this one is told from the perspective of the loveable and often mistaken Junie B. Jones. This time she has gotten a Valentine from a secret admirerer and she must find out who it is.